Ask the Builder: What Are The Red & Blue Pipes In My House? If you live in a home that was built more than 20 years ago, odds are if you peek under your kitchen counter, you’ll see copper pipe coming up from the floor and supplying your faucet. This has been the standard for plumbing fixtures since the 1920s. If, however, you have a home that was built in the past 10-15 years, you probably won’t see that familiar shiny pipe under your sink at all, but rather, two colored plastic lines; one red, and one blue. Have you ever wondered what’s up with that? Once building departments across America started accepting and recommending the use of PEX in building homes, it really took off, and is now the preferred material in most regions, including Colorado Springs. Stauffer & Sons Construction uses PEX in all our homes, and it’s really an excellent building material. As you can see in the photo above, we still do use copper from time to time (such as connectors and manifolds), but for the most part, a home’s hot and cold water lines will be made of PEX. 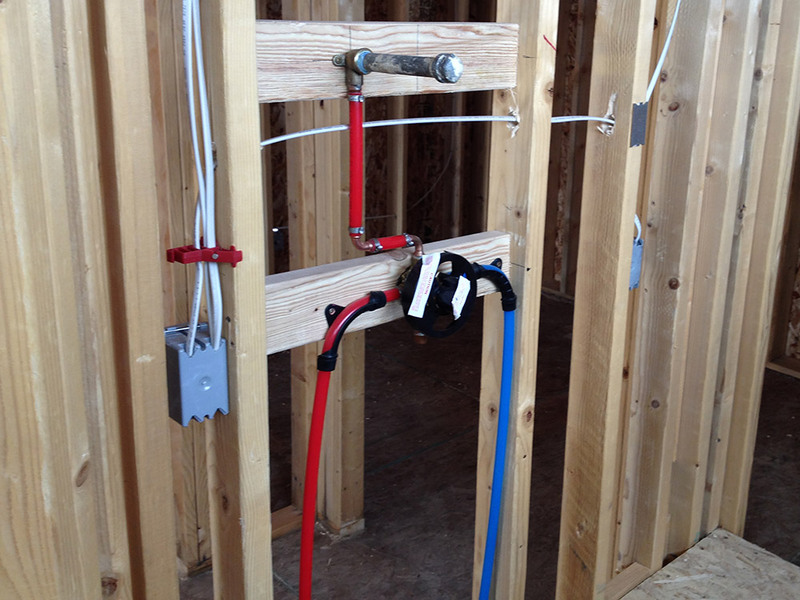 One of our favorite things about PEX is that it’s color-coded, which, if installed properly, means it’s simple to know exactly which lines are hot, and which are cold, which makes for easy repairs or modifications if needed. One thing that’s important to note is that people should not confuse PEX with the gray plastic polybutylene pipes that were subject to a massive ($1.1 Billion) class action lawsuit back in 2005 (Cox v. Shell) that gained a lot of publicity. This older type of pipe (also called “PB1 pipe,” “poly pipe” or “QEST” pipe) is famous for failing and causing major water damage, and is something we’ve never used in homes, and manufacturing for it ceased back in 1995. The fact of the matter is, PEX is a superior plumbing material, and it’s been proven across the USA for many years to be a reliable, efficient, and inexpensive option for homes. We’re big fans of PEX, and now you know why.